Are you in the mood to be bad? Do you want to revenge yourself on the world? Does the idea of having your own themed gang of costumed goons sound really appealing? 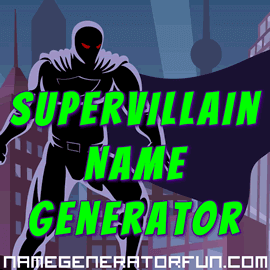 If so, then it's time for you to find your secret lair, embark on your evil schemes, and create a new identity with our supervillain name generator! Where there's good, there's always bad – and the rise of superheroes since Superman's first appearance in 1938 has also meant a corresponding rise in dastardly supervillains. These menacing masters of madness and mayhem have wreaked havoc in comics and movies, and you can create your own with our villain name generator, which can either create random bad guys, or a unique character that's based on your own name. We've worked really hard to make the names as distinctive and true to the spirit of old-school Marvel and DC Comics as possible, and along with your new villain name, you'll also get an origin story, a set of superpowers, a distinct henchman, an army of goons, and a home town to target with your sinister machinations! Whether you want to be a mad scientist, a powerful crime lord or a megalomaniacal tyrant, you can use our generator to create memorable and cool screen names for social media or forums, supervillain characters for role-playing games, or just for the sheer evil fun of it! Disclaimer: this is a fan commentary page intended to encourage interest in supervillains. This page is not an official publication and is not in any way affiliated with or endorsed by DC, Marvel Comics, or any of their licensees. Copyrights and trademarks for the books, films, articles, and other promotional materials are held by their respective owners and their reference is allowed under the fair use clause of copyright law. The extremely limited use of the word "supervillain" is in no way intended to harm or undermine the market value of trademarked works, rather to encourage fans to engage with and seek out those works.